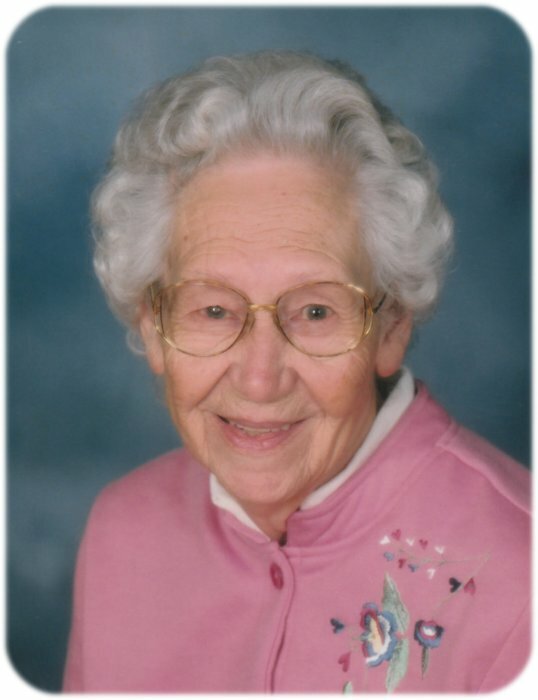 Funeral services for Jurine L. Johnson, age 97, of Albert Lea, will be held at 10:00 a.m. on Saturday, February 16, 2019 at Bayview/Freeborn Funeral Home. Pastor Sean Forde will officiate. Interment will be at Hillcrest Cemetery. Visitation will be one hour prior to the service at the funeral home. Online condolences are welcome at www.bayviewfuneral.com. Jurine died Monday, February 11, 2019 at Mayo Clinic Health System – Albert Lea. Jurine Lucille (Arett) Johnson was born on October 26, 1921 in Mower County, east of Moscow on the family farm; Jurine was the second born of ten children to this family. Jurine was baptized into the faith on January 29, 1922 at St. Olaf Lutheran Church in Austin, MN and confirmed at First Lutheran Church in Albert Lea, MN. On August 14, 1939 in Algona, IA, Jurine and Roland Johnson were united in marriage. To this union five children were born: Charles, Stanley, Ronald, Kenneth, and Marsha. Jurine and Roland moved to Oakland, MN until Roland’s death in 1994. Jurine then moved to St. Ansgar, IA to be closer to her daughter Marsha and lived there for 19 years. Jurine and Marsha spent many hours of enjoyment going to Christian Women’s club meetings, herb festivals in Greene, Iowa, and First Lutheran Church bazaars in St. Ansgar each year. They enjoyed the bazaar’s wonderful salad luncheon and never left without purchasing some lefse. Jurine visited Marsha and Harlan’s farm and enjoyed many meals together and helped Marsha prepare and preserve the garden produce. Jurine later moved to Austin, MN to live near her son Ronald and daughter-in-law Barb and her grandchildren. Jurine was a resident at Our House Assisted Living for three years and enjoyed her little apartment very much and all their holiday celebrations. Jurine became a resident of St. John’s Lutheran Community in March of 2016, and had the opportunity to live near her son Charles and her grandchildren in Albert Lea. Jurine enjoyed the birds at St. John’s and the various music each month that was provided. Jurine and Marsha enjoyed walks around the grounds of St. John’s and the summer gardens that were planted each year. Jurine kept track of the first shoot of rhubarb that came through the ground each spring, and the flowers and vegetables that were growing. That first radish of the summer is always wonderful and Jurine loved to make a radish sandwich. Jurine used to go to visit in Sioux City, IA her son Kenny and wife Linda and grandchildren and great grandchildren. Kenny’s daily calls meant the world to Jurine; she looked forward to them each day and shared the news with the rest of the family. She loved spending time with the family. Sundays were a time of worship for Jurine either at the chapel at St. John’s or quite often Peace and Power of First Lutheran Church of Albert Lea. Jurine listened to Peace and Power for many years; thank you so much for your outreach of this project. Jurine is survived by her children, Charles Johnson of Albert Lea, Kenneth (Linda) Johnson of Sioux City, IA, and Marsha (Harlan) Kuntz of St. Ansgar, IA; daughters-in-law, Rita Johnson of Albert Lea and Barbara Johnson of Austin; 17 grandchildren, 35 great-grandchildren, and 15 great-great-grandchildren and counting; sisters, Margie Barber of Northwood, Iowa, Libby (Darrel) Maternowski of Inver Grove Heights, MN, Marlene Brown of Minneapolis, MN; and brother, Jerome (Karen) Arett of Albert Lea. Jurine was preceded in death by her parents, William and Ethel Arett; infant brothers, William and Kenneth Arett; brother, Lawrence Arett; sisters, Kathleen Olson and Mabel Reichow; husband, Roland Johnson; sons, Stanley and Ronald Johnson; and grandson, Ronald Dean Johnson, Jr.